It was all change at the top at the Portugal Masters yesterday and Paul Krishnamurty's each-way fancy, Lucas Herbert, now shows the way. Here's the third round leaderboard with prices to back at 10:10. Andy Sullivan was five clear through three rounds when he won here three years ago and Lucas Bjerregaard held a one-stroke advantage before converting 12 months ago and the 2016 winner, Padraig Harrigton trailed by just one through 54 holes so the last three winners have been right in the van before the final day's play but this is definitely a place where winners can come from some way off the pace. The five winners between 2009 and 2013 were all some way off the pace after three rounds, trailing by three, seven, four twice and six strokes. Laying the front two and seeing what the day brings may not be a bad plan given the event's history but the leader has looked very solid so far. A bogey at the tough par 16th yesterday is Herbert's only dropped shot all week and he might just take some passing. Fresh off a win on the Challenge Tour just two weeks ago, the 2011 winner, Tom Lewis put in a terrific charge yesterday with a ten-under-par 61, but as always, it won't be easy to follow that brilliance. Paul's Find me A 100 Winner pick, Marcus Kinhult, who's already met both lay targets, started very quickly yesterday, playing the first seven holes in six-under-par but he got stuck after that and I just wonder if he can kick on again today. Eddie Pepperell looks the biggest danger to the leading pair and I've played him modestly at [8.8] but I'm also still cheering on pre-tournament fancies, Mikko Korhonen and Haotong Li, who trail by five and six shots respectively. They'll need something special and/or help from the leaders but as highlighted already, it has been done here before. Over at the Tour Championship, Tiger Woods bolted form the gates in round three, playing the first seven holes in six-under-par. He was matched at just [1.31] as he raced clear but he played the final third of the course in one-over-par and it's certainly not a done deal now. Here's the current standings with prices to back at 10:20. It may not be a done deal but it looks like a three-man race now and if this had been a few years ago we'd all be calling it a one-man race. As Justin ray points out below, Tiger was something else with a lead in his pomp. Tiger has converted 42 of 44 outright 54-hole leads in his PGA Tour career. Just those 42 wins alone would put him 10th on the all-time list, 1 behind Phil's 43. This is very different though, this is the first time he's led through 54 holes in more than five years. He's 42 now and those ruthless nerves of steel simply can't be what they once were. We've seen evidence of that already this year when he contended at the Valspar and after he'd hit the front at the Open Championship. Winning again is a huge deal for Woods and he's almost certain to feel the heat later. Playing alongside Woods is Rory McIlroy but I prefer the chances of my pre-event pick, Justin Rose. McIlroy hasn't played well when in-contention for some time. Since he won this event two years ago, he's gone in to the final round placed inside the top-three and within three of the lead nine times and he's been also been fifth and seventh but still within three of the lead but he's won just once - at the Arnold Palmer in March when Henrik Stenson flopped from the front. Having not led through 54 holes in so long, Woods has to prove himself again today but one could argue that McIlroy has far more questions to answer after his poor run in-the-mix. I'm going to leave it alone and see what happens but Woods looks a fair price at anything better than [1.6] and I certainly wouldn't want to take him on. I'll be back tomorrow with the De-Brief. What a Portugal Masters we're having so far this year. Nicolas Colsaerts recorded the tournament's first albatross on Thursday, when he holed out from the fairway on 12, before Oliver Fisher recorded the European Tour's first sub-60 round yesterday. Whatever next? The event's first ever playoff on Sunday maybe? Anyway, here are the latest standings with prices to back at 10:00. Despite Fisher's brilliance yesterday, when he moved up 92 places to grab a share of the lead, the stats suggest making up ground from halfway is hard here. All 10 winners (when the event has gone to 72 holes) have been within five strokes of the lead at halfway and Richard Green, in 2010, is the only winner not to be inside the top-eight places at this stage. That is a bit misleading though as two winners, Green and David Lynn three years later, both slipped down the leaderboard in round three and won from even further adrift. Green trailed by seven and Lynn six with just a round to go so make of it what you will. We've seen winners come from way back with a round to go but not from halfway. It's a bit of a head-scratcher. I feel like I've missed a trick here. When I looked at the situation after round one it was Eddie Pepperell and Matt Wallace who I liked and I could have backed the two combined at the same price that they're priced at individually this morning so I'm going to grit me teeth, stop myself from kicking the dog, and hold off again today. I still think they're the most likely winners but so does the market and having missed backing the pair at a combined circa 9/2, I'm not diving in this morning at around the 5/2 mark. I'm going to leave it alone for now but Fisher's price looks slightly generous. I know the perceived wisdom is that it's very hard to back up a super-low round but he must be on cloud nine and, in an attempt to win the stating the bleeding obvious award, he looks to be playing quite well. 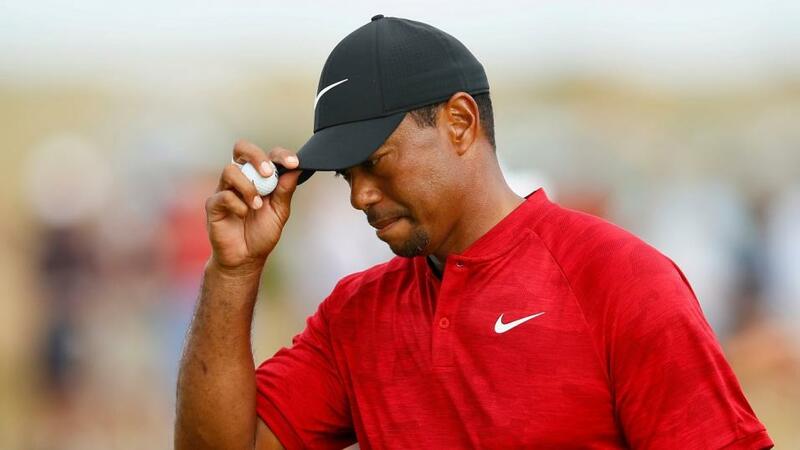 Over at the Tour Championship, only a sloppy double-bogey at the 16th hole has prevented Tiger Woods heading in to the weekend with a clear lead. Here are the latest standings, with prices to back at 10:00. We've seen a number of players win this title from five strokes adrift at halfway in recent years. Rory trailed by five two years ago and both Brandt Snedeker, in 2012, and Phil Mickelson, in 2009, also trailed by five. Rory sat fifth but Sneds was 10th and Lefty 12th so it's possible to pass a bit of traffic and the winner may not be listed above. If you fancy an off the pace winner go for it but after firing a few blanks yesterday I'm going to leave this one alone for now too. I'm still hopeful that pre-event pick, Justin Rose, can convert and after his five-under-par 65 yesterday, Billy Horschel's in-the-mix too. Rose, Tiger Woods and Rory McIlroy dominate the market and rightly so but they look priced up correctly to me and I'm happy to let it roll and reassess tomorrow. Rickie Fowler was steady all day and Tiger Woods eagled the last to join him on five-under-par but leading after round one isn't necessarily a good thing. Henrik Stenson, in 2013, won wire-to-wire and Billy Horschel was never headed 12 months later but Bart Bryant was the last first round leader aside from those two to win, back in 2004. Last year's winner, Xander Schauffele, sat tied for 17th and five adrift and Camilo Villegas and Phil Mickelson won the event in 2008 and 2009 having trailed by eight and seven strokes respectively after round one so we can scan some way down the leaderboard for an in-play wager. I see tied 17th this year is also five adrift, as it was last, and there are some quality players at big prices on that mark. Francesco Molinari at [80.0] catches my eye. The Open winner started slowly at the BMW Championship last time out, opening with a 70 before rounds of 63-64-67 saw him climb to eighth and he came from way off the pace to win at Carnoustie too so I'm happy to play him at that price, and I've also thrown a few pounds at the defending champ at [40.0]. He's two shots better off than he was at this stage last year and he clearly loves a Donald Ross design having been beaten by just a stroke at Aronimink last time out. As brilliant as it is, I'm still not entirely convinced by the Woods return to form, in that I'm not sure he's yet up to winning an event of this magnitude, and he went backwards after a great start two weeks ago so I'm swerving him and Fowler, who, as per usual, looks too short, but I'm more than happy to be on world number one, Justin Rose, from the start. Often a slow starter, and with all sorts of pressure on his shoulders, Rose did very well to carve out a four-under-par opening round with a cold putter yesterday. He's now moved to number one in the FedEx Cup standings and he's still the man to beat for my money. I'll be back tomorrow at the halfway stage of both events. News broke before the off at the Portugal Masters that the rough was up at Vilamoura but just like last year, 26 players ended the opening day on -4 or better so it didn't have too much of an effect on the scoring - although the majority of the leaders did rank highly for Driving Accuracy. I haven't been able to ascertain the AM-PM split for today's first round yet, but ten of the 15 players now tied sixth or better after round one teed it up this morning. I'd hazard a guess that the averages will show that the early starters enjoyed the kinder conditions but that hasn't stopped Paul Krishnamurty's each-way pick, Lucas Herbert, ending the day in front, despite being one of the last to start today. The Australian youngster posted an immaculate bogey-free eight-under-par 63 but there are three well-fancied players tied for second and one of them, Shane Lowry, who also played this afternoon, now heads the market. The 2012 winner managed to get to seven-under-par despite bogeying both the par fives on the back-nine and he's the new favourite but if I had to name the winner now I'd plump for one of the two Englishmen alongside him, Matt Wallace and Eddie Pepperell. Wallace, who was paired with Sergio Garcia, the man who edged him out of the European Ryder Cup team, was particularly impressive and Pepperell also commands plenty of respect. He was third last year but the last time he shot 64 on day one here, two years ago, he went on to miss the cut and lose his card! It's best to ignore the 2014 edition as heavy rain curtailed the event to just 36 holes but looking at the ten 72 hole events here, three winners started slowly. The inaugural winner, Steve Webster, sat seventh after round one but he trailed by five and the 2010 and 2011 winners, Richard Green and Tom Lewis, both sat six adrift with lots of traffic ahead of them. We probably need to be concentrating on the leaders though and the last five winners have sat 4th, first, first, 12th and eighth after day one and the most any of the five trailed by was three - Padraig Harrington two years ago. Pre-event picks, Haotong Li and Mikko Korhonen, sit on -6 and -5, alone in fifth and tied for sixth, but the others have been disappointing. I was tempted to get both Wallace and Pepperell onside but after much deliberation I've decided to hang fire for now and I'll take another look at halfway. The first round of the Tour Championship is well underway and currently live on Sky. I'll be back in the morning to take a look at that one.